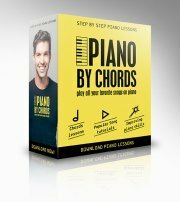 This chord piano lesson is made for those who wish to take a step further with their harmony studies and establish the chord theory we've been learning so far. Let's refresh our memory for a moment. Until today we learned about the chord construction of three-voice chords (triads). We started to construct a chord from its root note by building thirds above it in the structure of a certain scale. When we added major third to the root note we created the chord construction of a major chord. 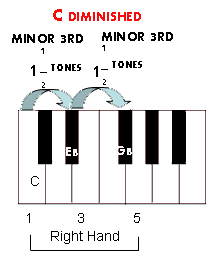 If we added a minor third to the root note we form a chord construction of a minor chord. Next we learned to deal with the fifth note of the chord. Adding a pure fifth to the chord doesn't change the structure of the chord much. It mixes well with both major and minor thirds, but it doesn't add anything new to the identity of the chord. However, we learned that we can raise the fifth and of a major chord and create an augmented chord or lower the fifth of a minor chord and make it a diminished chord. Now I'd like us to go a step further and add a fourth voice over the triads in order to create a seventh chord. What we're basically going to do is simple. 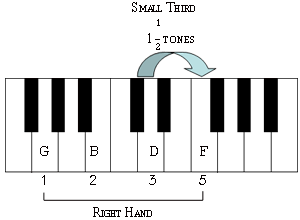 In order to create a triad (three-voice-chord) we took the scale degrees and added the third and the fifth note of each scale degree within the scale structure. Now we're going to take this one step further and add the seventh note and see what happens, like this example of G7. The story of the seventh chord moves in two different dimensions. The first direction is to define the chord as a clear dominant chord and the other is to add colour to the chord. We're going to talk about both aspects here. Earlier in our studies when we learned about 7th chords. we talked about the dominant chord. I told you that the fifth degree is called "The Dominant" since it creates a clear tension that points us toward the tonic. In other words the fifth degree wants to go back home to the first degree. Great! But why? Because of voice leading. We can divide the notes in a scale to two groups, the inside notes and the outside notes. The so called inside notes are static notes. They symbol the relaxation in the scale and are serving as a skeleTone :). Each outside note in the scale wants to go towards an inside note. The relationship between these two groups in the scale allows us to create the relationships between the different chords. The more a chord contains outside notes the more it points toward the tonic. That's handy to know when learning about chord construction. Let's take C major for example. 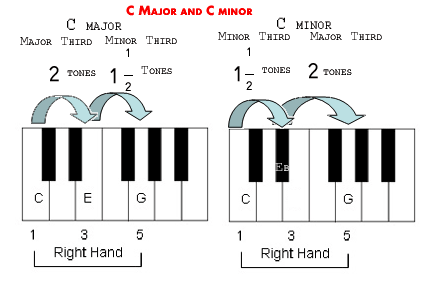 The inside notes of C major scale are the notes that form the chord of the tonic, the C major chord (C,E and G). C functions as the ultimate rest and E and G are relatively static (but it ain't over 'till you reach the home base again). Makes sense, doesn't it? The outside notes could step down or up to relieve the tension except for the leading tone which steps up. 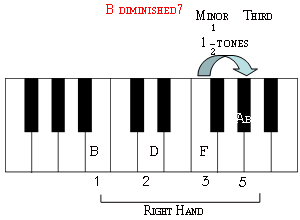 The outside notes of the C major scale are D, F, A, B. 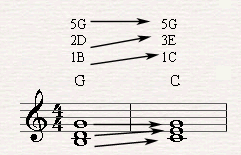 The D note (second note) wants to go to C or E.
The F note wants (fourth note) to go to E or G.
The A note (sixth note) wants to go to the G note or climb up through A and B all the way to the Tonic. And the B note (leading tone and seventh note of the scale) is leading us back to C, the tonic. It contains the most tension in the scale. Note that both D and B want to go back to the tonic. Now let's go back to chord construction starting from the dominant chord. The fifth degree of C major, G major contains these notes G, B, D, . two outside notes and one inside note. G is an inside note and therefore it stays static. B, the third note of G major (B which is also the leading note in a C major scale) is the leading tone of C major and is clearly taking us back to C (The first note of the scale). D is the second note of C major and as an outside note it wants to go to E in this case. We can now see how G major leads us to C major. 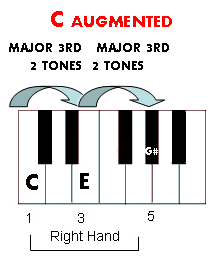 G major however could function also differently and lead us to some other scale so composer found a way to distinguish the chord as part of the C major scale in a way that it has to lead to the tonic without any doubt. We add the seventh note to the chord construction, which increases the tension even more towards the tonic chord. F is the seventh in a G major Chord. (G is the fifth degree of C major scale. What you have to do is step up seven notes in C major starting from G.
F is the fourth note of C major scale and as I've shown you above, it is an outside note wanting to go to the third whithin half a tone which means more tension, and here it is, our new-born baby. Your tensed dominant chord will always take you back to the tonic chord C major. If we check the intervals of the chord we will see that we've added a minor third above the fifth note. Here's a free piano chord chart of all twelve dominant chords that will help you find your way on the piano. Now that we've really learned about the chord construction of the dominant seven chord here's once again a free piano chord chart of the I-V7-I in all twelve major scales. Pay attention to the voice leading in this chord chart. What's we're going to learn next is about the possibility to raise the seventh note (Which is located a whole tone under the root note) and create a major seventh note (So instead of playing a C7th chord (C, E, G, Bb) you play (C, E, G, B). 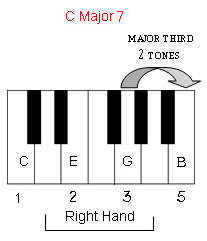 The seventh note of the C major chord in C major scale is the major seventh. If we look at the intervals we will see that concerning chord construction you should basically add a major third over the fifth note of the major chord. The major seventh gives the chord a wide open sound deriving from the presence of two major thirds in the chord. In this case it serves as a color provider. Here's a free piano chord chart to make sure you get this right. If we add a seventh note to a minor chord we get a D minor seventh chord (By counting seven notes from D in the frame of C major: D, E, F, G, A, B, C, D). 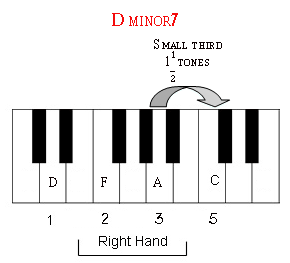 The seventh note of D minor is a small third above the fifth note. Here's a free piano chord chart with all minor seventh chord to assist you locating them on the piano easily. It's important to realize that only MAJOR SEVENTH CHORDS function as dominant chords and the minor seventh chord is not strong enough for the because of less tensed voice leading. The seventh note in this case serves more as a colour provider. When we add the seventh note to a diminished chord we add a major third above the fifth note of the chord. This chord contains two small thirds and a major third. 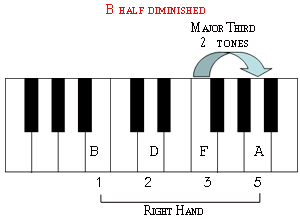 Such a chord is called a half diminished chord. Guess what? I've made you another free printable piano chord chart of all twelve half diminished chords. The half diminished chord is called so because the seventh wasn't lowered like the other intervals of the chord. If we lower the seventh as well by a semi tone we get a chord made of three small thirds one on top of the other. Such a chord contains a lot of tension. Here's the final piano chord chart of this page with all twelve diminished seven chords. The problem is there aren't many methods the teach you how to move smoothly between the different chord progressions and learn how to use them in practice. Luckily for you I have found a great method that does all that online. The Rocket Piano have an amazing method that will get you there like no other piano teacher would. Click here to check out the Rocket Piano Ultimate Piano Learning Kit.